J.C. Newman's solid and affordable Quorum cigar is now available in a deliciously dark Maduro wrapper leaf. Expect the same high quality smoke at an awesome price, this time with a hearty taste of the rich and sweet maduro character you crave. Quorum Robusto Maduro is a medium bodied smoke with smooth tones of cocoa, cedar, and more in a 4 3/4 x 50 Robusto - the perfect tasting size! My everyday cigar. Great price and a decent smoke! I think the Quorum robusta maduro is the best cigar for the price . It’s my daily cigar of choice for sure ! These are my favorite smokes. Quality cigar for a economy price! Great smoke for the price. Always enjoy a short smoke. I bought one these from a local store for $3.50 and I’m impressed these are a really good budget cigar with smooth leather and chocolatey flavor and to keep the review short I’ll definitely be buying some of these now that I know what a value they are (likely in the short robuso size especially since I can get them for less than half what I paid for them. 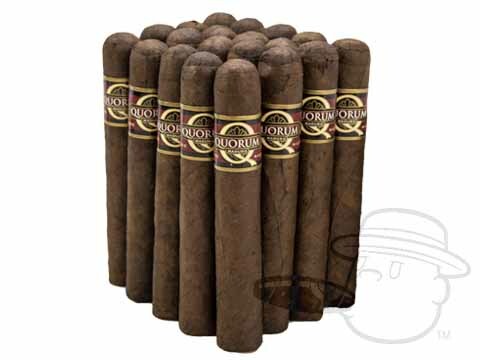 Quorum Robusto Maduro is rated 3.5 out of 5 based on 11 customer ratings.